Polish Prime Minister Mateusz Morawiecki addresses controversial bill, stresses Poland will not limit freedom to debate the Holocaust. Polish Prime Minister Mateusz Morawiecki on Thursday addressed the controversial bill approved by the Polish Senate on Wednesday night and which would make it illegal to suggest Poland bore any responsibility for crimes against humanity committed by Nazi Germany on its soil during World War II. 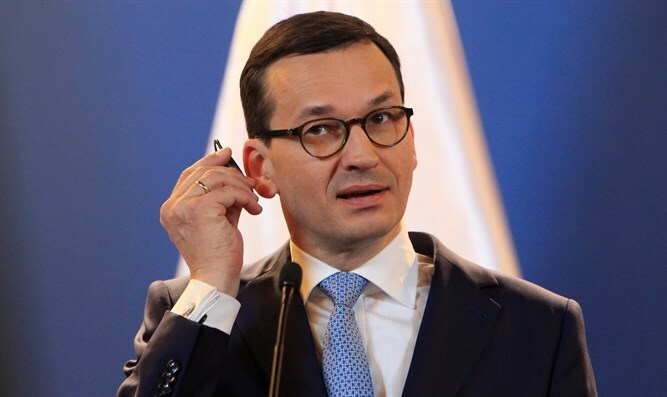 Morawiecki stressed that Poland would never limit the freedom to debate the Holocaust and added that Warsaw understood Israel’s emotions about the issue. “We will never limit the freedom to debate the Holocaust,” Morawiecki said on the Polish state television TVP, as quoted by Reuters. “We understand the emotions of Israel. We need a lot of work to make our common, often complicated, history possible to tell together,” he added. On Wednesday night Poland's upper house of parliament voted 57-23, with two abstentions, to approve the bill. The bill would make the use of phrases such as “Polish death camps” punishable by up to three years in prison and would apply to both Polish citizens and foreigners. The legislation must now be signed into law by Polish President Andrzej Duda to be signed into law. Duda said earlier this week he supports the bill and insisted there was no institutionalized participation by Poland or its people in the Holocaust, though he did acknowledge that individual Poles took "wicked" actions against Jewish neighbors. The Polish Senate voted on the legislation despite an agreement between Morawiecki and Prime Minister Binyamin Netanyahu earlier this week, that the two sides would hold a dialogue in order to try to reach understandings on the controversial legislation. Israel's Foreign Ministry responded on Thursday to the Polish Senate's decision to approve the law. "The State of Israel firmly opposes the Polish Senate's decision," a ministry spokesperson said. "Israel views with gravity all attempts to harm the historical truth. No law will change the facts."